Yes, I know, I’ve talked lots about the Ginger Bliss and the Violet Fizz release party that was at the Rob Roy a week or so ago. And I’ve posted a couple drinks from the book, and made a short video about joining the GBVF Army, that talks a bit about the book. But I haven’t given (I don’t think) the book a proper overview here yet, for those who may have missed the party and aren’t quite sure why they need a copy. So, first, a quick overview, and then (second) some fun facts. Ginger Bliss and the Violet Fizz is designed in a very particular manner. Unlike other numerous classic and modern cocktail tomes available that break out chapters by base spirit (gin, vodka, brandy, whiskey, tequila, and sometimes Champagne), or the fine volumes that are alphabetical by drink, or the other worthy reads (including a few by yours truly) that break chapters out by theme, this book is divided into chapters by flavor profile. By “flavor profile” I’m talking about what the flavor is of a particular liqueur that’s responsible for the personality and taste of a drink. There’s a chapter on A Liquid Citrus Circus, for example, containing recipes highlighted by the vast panoply of fun orange and other citrus liqueurs, and a chapter that reminds you to Take Your Herbal Medicine that contains darker, more intense, herbal liqueurs that are popping up more regularly. There’s also a chapter detailing The Justice League of Vermouths–though they aren’t specifically liqueurs, vermouths and their cousins are also part of the path to joining the GBVF Army–and other flavor specific chapters. By breaking out the chapters in this flavor-oriented way, it makes it easier to plan a party around a few signature drinks as well as easier to find a particular drink matching up with what you’re craving. The idea is to make it a snap for you to pick out a few signature drinks to make any gathering sparkle: from parties of many people to those that are just you and a significant other. GBVF has over 200 recipes, some lesser-known classics, some from here and there, and a bunch from modern pro-and-home bartenders, including recipes from: Andrew Bohrer, Ed Skoog, Matt Bohlmann, Jeffrey Morgenthaler, LUPEC Boston, Jeremy Sidener, Paul Abercrombie, Meaghan Dorman, Jay Hepburn, Robert Hess, Yuri Kato, Augusto Lino, Kelly, Magyarics, Thad Volger, Kara Newman, Jim Romdall, David Shenaut, Doug Winship, Erik Ellestad, Chantal Tseng, and probably a few others I’m forgetting a will feel bad about later. Look these fine people up and support them. There are at least 14 mentions of comic book or comic strip characters, including two Dr. Strange references (to make Neilalien happy) and a whole chapter called The Justice League of Vermouths (to make pal PhiSmi happy). There is one current NBA basketballer mentioned (Andrew Bogut) and three past ballers (Gary Payton, Shawn Kemp, and Nate McMillan). There are a number of sidebars to help you pick drinks for specific party occasions, including 4 Drinks for Fishing. One drink is named after a short short story by the novelist J. Robert Lennon. Guess which one? 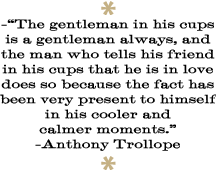 There are 27 Liqueur Spotlights, which go deeper into the taste, history, and personality of individual liqueurs. There are two mentions of Tom Waits, and one drink (The Hounds They Start To Roar) named from a Tom Waits lyric. There is also one mention of the little known Kansas City band Shooting Star. Perhaps, after all, it is best to stick to Pernod, if the sartorial consequences of imbibing interest you as much as they do me. This if only for the reason that however you start off drinking the stuff, you’re bound to end up more or less naked. There are sidebars pointing to classic cocktail books, favorite new cocktail books, favorite booze blogs, boozy poem quotes, and other ways to stock your literal and electronic libraries. Finally, the first drink in the book is the 14 Juillet and the last is the Ti Penso Sempre. 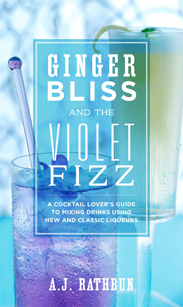 Now, you know a bit more about Ginger Bliss and the Violet Fizz. So, whacha waiting for? Join the GBVF Army today! Hello and happy Monday! It’s not only now less than two weeks before the below-mentioned Ginger Bliss and the Violet Fizz Rob Roy release event, but today is also the birthday of Mr. Ed Skoog, a poet and cocktail aficionado of the first ranking, whose poems highlight the compilation of drinking verse called In Their Cups, and whose past spirited creations have been in Dark Spirits, that compendium of darkly-natured drinks. Those two occurrences (Mr. Skoog’s birthday and upcoming GBVF party) make this the absolutely perfect day to drink an Ellipse. Why? 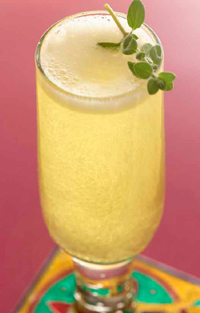 Cause it’s a drink created by Skoog that’s featured in Ginger Bliss and the Violet Fizz. A delicious and creative drink, I may say, also, though you should expect that from Mr. Skoog. And I expect you to wish him happy fortieth today, if you happen to see him. And buy him a drink why dontcha? 1. Add the marjoram to a cocktail shaker. Using a muddler or wooden spoon, muddle gently. 2. Fill the cocktail shaker halfway full with ice cubes. Add the Strega. Shake well. 3. Strain (preferably with a fine-mesh strainer) into a flute glass. Top with Prosecco, almost to the rim, and garnish with the marjoram. Hello hello, and sorry for the extended holiday break from blog posts. But at least I left you with the first two episodes of the new season of the Cocktail to Cocktail Hour (still four more new episodes left—can you believe it!). 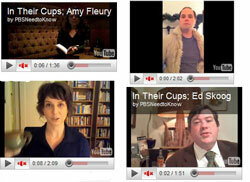 And, I’m back to help you start your New Year right, with a link to a blog post on the PBS blog The Daily Need, a post which features videos from four (that’s right, four) of the poets who have poems in In Their Cups: An Anthology of Poems about Drinking Places, Drinks, and Drinkers. Each poet is reading one of the poems they have in the book while sipping on a favorite drink. I can’t think of any way to kick start a cocktail-a-rific and poetic year than by watching the videos (repeatedly, to ensure the year is really all that and then some). The post includes videos featuring amazing writers (and charming drinking companions) Ed Skoog, Amy Fleury, Emily Bedard, and also a video with me (wearing a boss coat, I have to admit). So what are you waiting for? Get your year started right by heading to the Daily Need now. For the last poem in In Their Cups week 2010 (celebrating the release and release party this Sunday for In Their Cups and the drinking poems contained therein, as if you didn’t know), I wanted to highlight one of the two poems in book by Ed Skoog (I should mention though, that he also has translations in the book from three languages–you’ll have to look to find out which languages). Without Ed, In Their Cups would have been called “Cups with Holes” and been awfully leaky, cause he not only let me put poems and translations of his own in the book, but helped me track down more poems that made the cut and are in the book, gave advice on ordering of poems and sections, drank a lot with me during the putting together of the book, and was generally helpful in every way you can think of plus a few more you’d forgotten. If you don’t know already, Ed is one of the best poets anywhere alive today–buy his book Mister Skylight and you will be changed–but is also a drink maker of some renown, a drink consumer of much renown, and a sweet banjo player to boot who can sing the high lonesome like few others (even after a few–let’s say 5-to-10–shots). If you ever are going into a bar for the long haul (which I’m guessing you will be, probably soon), bring him along. Or at least bring this poem of his about New Orleans’ Saturn Bar, a truly divine dive, along with you as an Ed sub. spiraling neon, neon that lights up my nameless shot.